Agile Modeling (AM) is a practice-based methodology for effective modeling and documentation of software-based systems. Simply put, Agile Modeling (AM) is a collection of values, principles, and practices for modeling software that can be applied on a software development project in an effective and light-weight manner. As you see in Figure 1 AM is meant to be tailored into other, full-fledged methodologies such as XP or RUP, enabling you to develop a software process which truly meets your needs. In fact, this tailoring work has already been done for you in the form of the Disciplined Agile Delivery (DAD) process framework. Figure 1. AM enhances other software processes. 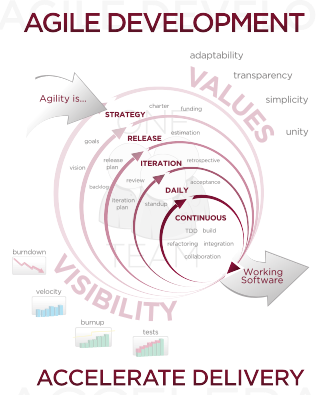 The values of AM, adopting and extending those of eXtreme Programming are communication, simplicity, feedback, courage, and humility. The keys to modeling success are to have effective communication between all project stakeholders, to strive to develop the simplest solution possible that meets all of your needs, to obtain feedback regarding your efforts often and early, to have the courage to make and stick to your decisions, and to have the humility to admit that you may not know everything, that others have value to add to your project efforts. AM is based on a collection of principles, such as the importance of assuming simplicity when you are modeling and embracing change as you are working because requirements will change over time. You should recognize that incremental change of your system over time enables agility and that you should strive to obtain rapid feedback on your work to ensure that it accurately reflects the needs of your project stakeholders. You should model with a purpose, if you don’t know why you are working on something or you don’t know what the audience of the model/document actually requires then you shouldn’t be working on it. Furthermore, you need multiple models in your intellectual toolkit to be effective. A critical concept is that models are not necessarily documents, a realization that enables you travel light by discarding most of your models once they have fulfilled their purpose. Agile modelers believe that content is more important than representation, that there are many ways you can model the same concept yet still get it right. To be an effective modeler you need to recognize that open and honest communication is often the best policy to follow to ensure effective teamwork. Finally, a focus on quality work is important because nobody likes to produce sloppy work and that local adaptation of AM to meet the exact needs of your environment is important. To model in an agile manner you will apply AM’s practices as appropriate. Fundamental practices include creating several models in parallel, applying the right artifact(s) for the situation, and iterating to another artifact to continue moving forward at a steady pace. Modeling in small increments, and not attempting to create the magical “all encompassing model” from your ivory tower, is also fundamental to your success as an agile modeler. Because models are only abstract representations of software, abstractions that may not be accurate, you should strive to prove it with code to show that your ideas actually work in practice and not just in theory Active stakeholder participation is critical to the success of your modeling efforts because your project stakeholders know what they want and can provide you with the feedback that you require. The principle of assume simplicity is a supported by the practices of creating simple content by focusing only on the aspects that you need to model and not attempting to creating a highly detailed model, depicting models simply via use of simple notations, and using the simplest tools to create your models. You travel light by single sourcing information, discarding temporary models and updating models only when it hurts. Communication is enabled by displaying models publicly, either on a wall or internal web site, through collective ownership of your project artifacts, through applying modeling standards, and by modeling with others. Your development efforts are greatly enhanced when you apply patterns gently. Because you often need to integrate with other systems, including legacy databases as well as web-based services, you will find that you need to formalize contract models with the owners of those systems. With an Agile Model Driven Development (AMDD) (see Figure 2) approach you typically do just enough high-level modeling at the beginning of a project to understand the scope and potential architecture of the system, and then during development iterations you do modeling as part of your iteration planning activities and then take a just in time (JIT) model storming approach where you model for several minutes as a precursor to several hours of coding. Figure 2. Agile Model Driven Development (AMDD). Another way to look at Agile Modeling is as a collection of best practices, as you see in Figure 3. Figure 3. The best practices of Agile Modeling. Model With A Purpose. Many developers worry about whether their artifacts — such as models, source code, or documents — are detailed enough or if they are too detailed, or similarly if they are sufficiently accurate. What they’re not doing is stepping back and asking why they’re creating the artifact in the first place and who they are creating it for. With respect to modeling, perhaps you need to understand an aspect of your software better, perhaps you need to communicate your approach to senior management to justify your project, or perhaps you need to create documentation that describes your system to the people who will be operating and/or maintaining/evolving it over time. If you cannot identify why and for whom you are creating a model then why are you bothering to work on it all? Your first step is to identify a valid purpose for creating a model and the audience for that model, then based on that purpose and audience develop it to the point where it is both sufficiently accurate and sufficiently detailed. Once a model has fulfilled its goals you’re finished with it for now and should move on to something else, such as writing some code to show that the model works. This principle also applies to a change to an existing model: if you are making a change, perhaps applying a known pattern, then you should have a valid reason to make that change (perhaps to support a new requirement or to refactor your work to something cleaner). An important implication of this principle is that you need to know your audience, even when that audience is yourself. For example, if you are creating a model for maintenance developers, what do they really need? Do they need a 500 page comprehensive document or would a 10 page overview of how everything works be sufficient? Don’t know? Go talk to them and find out. Maximize Stakeholder ROI. Your project stakeholders are investing resources — time, money, facilities, and so on — to have software developed that meets their needs. Stakeholders deserve to invest their resources the best way possible and not to have resources frittered away by your team. Furthermore, they deserve to have the final say in how those resources are invested or not invested. If it was your resources, would you want it any other way? Note: In AM v1 this was originally called “Maximize Stakeholder Investment”. Over time we realized that this term wasn’t right because it sounded like we were saying you needed to maximize the amount of money spent, which wasn’t the message. Travel Light. Every artifact that you create, and then decide to keep, will need to be maintained over time. If you decide to keep seven models, then whenever a change occurs (a new/updated requirement, a new approach is taken by your team, a new technology is adopted, …) you will need to consider the impact of that change on all seven models and then act accordingly. If you decide to keep only three models then you clearly have less work to perform to support the same change, making you more agile because you are traveling lighter. Similarly, the more complex/detailed your models are, the more likely it is that any given change will be harder to accomplish (the individual model is “heavier” and is therefore more of a burden to maintain). Every time you decide to keep a model you trade-off agility for the convenience of having that information available to your team in an abstract manner (hence potentially enhancing communication within your team as well as with project stakeholders). Never underestimate the seriousness of this trade-off. Someone trekking across the desert will benefit from a map, a hat, good boots, and a canteen of water they likely won’t make it if they burden themselves with hundreds of gallons of water, a pack full of every piece of survival gear imaginable, and a collection of books about the desert. 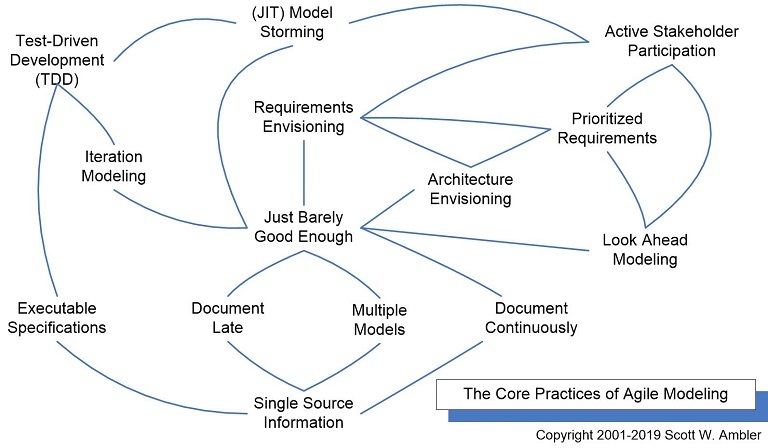 Similarly, a development team that decides to develop and maintain a detailed requirements document, a detailed collection of analysis models, a detailed collection of architectural models, and a detailed collection of design models will quickly discover they are spending the majority of their time updating documents instead of writing source code. Multiple Models. You potentially need to use multiple models to develop software because each model describes a single aspect of your software. “What models are potentially required to build modern-day business applications?” Considering the complexity of modern day software, you need to have a wide range of techniques in your intellectual modeling toolkit to be effective (see Modeling Artifacts for AM for a start at a list and Agile Models Distilled for detailed descriptions). An important point is that you don’t need to develop all of these models for any given system, but that depending on the exact nature of the software you are developing you will require at least a subset of the models. Different systems, different subsets. Just like every fixit job at home doesn’t require you to use every tool available to you in your toolbox, over time the variety of jobs you perform will require you to use each tool at some point. Just like you use some tools more than others, you will use some types of models more than others. Rapid Feedback. The time between an action and the feedback on that action is critical. By working with other people on a model, particularly when you are working with a shared modeling technology (such as a whiteboard, CRC cards, or essential modeling materials such as sticky notes) you are obtaining near-instant feedback on your ideas. Working closely with your customer, to understand the requirements, to analyze those requirements, or to develop a user interface that meets their needs, provides opportunities for rapid feedback. Assume Simplicity. As you develop you should assume that the simplest solution is the best solution. Don’t overbuild your software, or in the case of AM don’t depict additional features in your models that you don’t need today. Have the courage that you don’t need to over-model your system today, that you can model based on your existing requirements today and refactor your system in the future when your requirements evolve. Keep your models as simple as possible. Embrace Change. Requirements evolve over time. People’s understanding of the requirements change over time. Project stakeholders can change as your project moves forward, new people are added and existing ones can leave. Project stakeholders can change their viewpoints as well, potentially changing the goals and success criteria for your effort. The implication is that your project’s environment changes as your efforts progress, and that as a result your approach to development must reflect this reality. Incremental Change. An important concept to understand with respect to modeling is that you don’t need to get it right the first time, in fact, it is very unlikely that you could do so even if you tried. Furthermore, you do not need to capture every single detail in your models, you just need to get it good enough at the time. Instead of futilely trying to develop an all encompassing model at the start, you instead can put a stake in the ground by developing a small model, or perhaps a high-level model, and evolve it over time (or simply discard it when you no longer need it) in an incremental manner. Quality Work. Nobody likes sloppy work. The people doing the work don’t like it because it’s something they can’t be proud of, the people coming along later to refactor the work (for whatever reason) don’t like it because it’s harder to understand and to update, and the end users won’t like the work because it’s likely fragile and/or doesn’t meet their expectations. Working Software Is Your Primary Goal. The goal of software development is to produce high-quality working software that meets the needs of your project stakeholders in an effective manner. The primary goal is not to produce extraneous documentation, extraneous management artifacts, or even models. Any activity that does not directly contribute to this goal should be questioned and avoided if it cannot be justified in this light. Enabling The Next Effort Is Your Secondary Goal. Your project can still be considered a failure even when your team delivers a working system to your users – part of fulfilling the needs of your project stakeholders is to ensure that your system robust enough so that it can be extended over time. As Alistair Cockburn likes to say, when you are playing the software development game your secondary goal is to setup to play the next game. Your next effort may be the development of the next major release of your system or it may simply be the operations and support of the current version you are building. To enable it you will not only want to develop quality software but also create just enough documentation and supporting materials so that the people playing the next game can be effective. Factors that you need to consider include whether members of your existing team will be involved with the next effort, the nature of the next effort itself, and the importance of the next effort to your organization. In short, when you are working on your system you need to keep an eye on the future. Content Is More Important Than Representation. Any given model could have several ways to represent it. For example, a UI specification could be created using Post-It notes on a large sheet of paper (an essential or low-fidelity prototype), as a sketch on paper or a whiteboard, as a “traditional” prototype built using a prototyping tool or programming language, or as a formal document including both a visual representation as well as a textual description of the UI. An interesting implication is that a model does not need to be a document. Even a complex set of diagrams created using a CASE tool may not become part of a document, instead they are used as inputs into other artifacts, very likely source code, but never formalized as official documentation. The point is that you take advantage of the benefits of modeling without incurring the costs of creating and maintaining documentation. Open And Honest Communication. People need to be free, and to perceive that they are free, to offer suggestions. This includes ideas pertaining to one or more models, perhaps someone has a new way to approach a portion of the design or has a new insight regarding a requirement; the delivery of bad news such as being behind schedule; or simply the current status of their work. Open and honest communication enables people to make better decisions because the quality of the information that they are basing them on is more accurate. 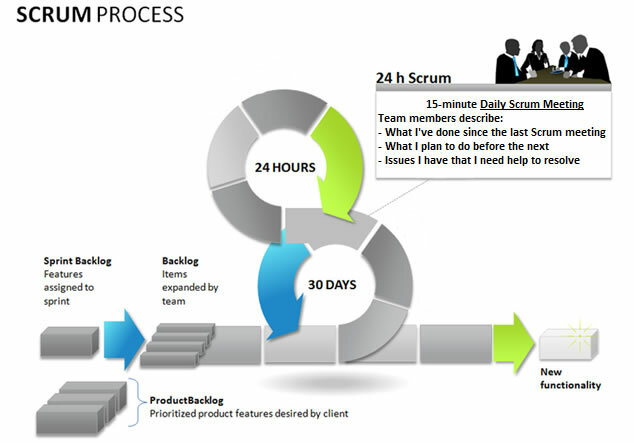 Figure 4 depicts how the AMDD activities fit into the various iterations of the agile software development lifecycle. It’s simply another way to show that an agile project begins with some initial modeling and that modeling still occurs in each construction iteration. Figure 4. 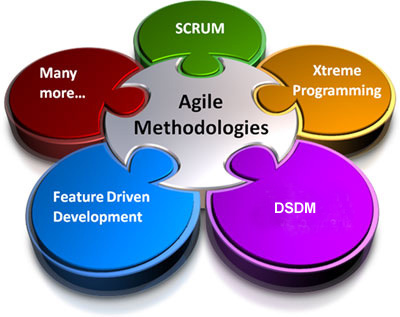 AMDD Through the Agile Development Lifecycle. As the name implies, AMDD is the agile version of Model Driven Development (MDD). MDD is an approach to software development where extensive models are created before source code is written. A primary example of MDD is the Object Management Group (OMG)’s Model Driven Architecture (MDA) standard. With MDD a serial approach to development is often taken, MDD is quite popular with traditionalists, although as the RUP/EUP shows it is possible to take an iterative approach with MDD. The difference with AMDD is that instead of creating extensive models before writing source code you instead create agile models which are just barely good enough that drive your overall development efforts. AMDD is a critical strategy for scaling agile software development beyond the small, co-located team approach that we saw during the first stage of agile adoption. Figure 5 depicts a high-level lifecycle for AMDD for the release of a system. First, let’s start with how to read the diagram. Each box represents a development activity. The envisioning includes two main sub-activities, initial requirements envisioning and initial architecture envisioning. These are done during Inception, iteration being another term for cycle or sprint. “Iteration 0, or Inception”, is a common term for the first iteration before you start into development iterations, which are iterations one and beyond (for that release). The other activities – iteration modeling, model storming, reviews, and implementation – potentially occur during any iteration, including Inception. The time indicated in each box represents the length of an average session: perhaps you’ll model for a few minutes then code for several hours. Figure 5. The AMDD lifecycle: Modeling activities throughout the lifecycle of a project. Figure 6 depicts how the AMDD activities fit into the various iterations of the agile software development lifecycle. It’s simply another way to show that an agile project begins with some initial modeling and that modeling still occurs in each construction iteration. Figure 6. AMDD Through the Agile Development Lifecycle. The envisioning effort is typically performed during the first week of a project, the goal of which is to identify the scope of your system and a likely architecture for addressing it. To do this you will do both high-level requirements modeling and high-level architecture modeling. The goal isn’t to write detailed specifications, that proves incredibly risky in practice, but instead to explore the requirements and come to an overall strategy for your project. For short projects (perhaps several weeks in length) you may do this work in the first few hours and for long projects (perhaps on the order of twelve or more months) you may decide to invest two weeks in this effort. Agilists highly suggest not investing any more time than this as you run the danger of over modeling and of modeling something that contains too many problems (two weeks without the concrete feedback that implementation provides is a long time to go at risk). Through initial, high-level modeling you can gain the knowledge that you need to guide the project but choose to wait to act on it. For the first release of a system you need to take several days to identify some high-level requirements as well as the scope of the release (what you think the system should do). The goal is to get a good gut feel what the project is all about. For your initial requirements model you need some form of usage model to explore how users will work with your system, an initial domain model which identifies fundamental business entity types and the relationships between then, and an initial user interface modelwhich explores UI and usabilityissues. your goal is to build a shared understanding, it isn’t to write detailed documentation. A critical success factor is to use inclusive modeling techniques which enable active stakeholder participation. The goal of the initial architecture modeling effort is to try to identify an architecture that has a good chance of working. This enables you to set a (hopefully) viable technical direction for your project and to provide sufficient information to organize your team around your architecture (something that is particularly important at scale with large or distributed teams). On the architecture side of things we often create free-form diagrams which explore the technical infrastructure, initial domain models to explore the major business entities and their relationships, and optionally change cases to explore potential architecture-level requirements which your system may need to support one day. In later iterations both your initial requirements and your initial architect models will need to evolve as you learn more, but for now the goal is to get something that is just barely good enough so that your team can get going. In subsequent releases you may decide to shorten Inception to several days, several hours, or even remove it completely as your situation dictates. The secret is to keep things simple. You don’t need to model a lot of detail, you simply need to model enough. If you’re writing use cases this may mean that point-form notes are good enough. If you’re domain modeling a whiteboard sketch or collection of CRC cards is likely good enough. For your architecture a whiteboard sketch overviewing how the system will be built end-to-end is good enough. Many traditional developers will struggle with an agile approach to initial modeling because for years they’ve been told they need to define comprehensive models early in a project. Agile software development isn’t serial, it’s iterative and incremental (evolutionary). With an evolutionary approach detailed modeling is done just in time (JIT) during development iterations in model storming sessions. At the beginning of each Construction iteration the team must plan the work that they will do that iteration. An often neglected aspect of Mike Cohn’s planning poker is the required modeling activities implied by the technique. Agile teams implement requirements in priority order, see Figure 7, pulling an iteration’s worth of work off the top of the stack. To do this successfully you must be able to accurately estimate the work required for each requirement, then based on your previous iteration’s velocity (a measure of how much work you accomplished) you pick that much work off the stack. For example, if last iteration you accomplished 15 points worth of work then the assumption is that all things being equal you’ll be able to accomplish that much work this iteration. This activity is often referred to as the “planning game” or simply iteration planning. Figure 7. Agile requirements change management process. To estimate each requirement accurately you must understand the work required to implement it, and this is where modeling comes in. You discuss how you’re going to implement each requirement, modeling where appropriate to explore or communicate ideas. This modeling in effect is the analysis and design of the requirements being implemented that iteration. With initial iteration modeling you explore what you need to build so that you can estimate and plan the work for the iteration effectively. Agilists experience is that the vast majority of modeling sessions involve a few people, usually just two or three, who discuss an issue while sketching on paper or a whiteboard. These “model storming sessions” are typically impromptu events, one project team member will ask another to model with them, typically lasting for five to ten minutes (it’s rare to model storm for more than thirty minutes). The people get together, gather around a shared modeling tool (e.g. the whiteboard), explore the issue until they’re satisfied that they understand it, then they continue on (often coding). Model storming is just in time (JIT) modeling: you identify an issue which you need to resolve, you quickly grab a few team mates who can help you, the group explores the issue, and then everyone continues on as before. Extreme programmers (XPers) would call modeling storming sessions stand-up design sessions or customer Q&A sessions. During development it is quite common to model storm for several minutes and then code, following common Agile practices such as Test-First Design (TFD) and refactoring, for several hours and even several days at a time to implement what you’ve just modeled. For the sake of discussion test-driven design (TDD) is the combination of TFD and refactoring. This is where your team will spend the majority of its time. Agile teams do the majority of their detailed modeling in the form of executable specifications, often customer tests or development tests. Why does this work? Because your model storming efforts enable you to think through larger, cross-entity issues whereas with TDD you think through very focused issues typically pertinent to a single entity at a time. With refactoring you evolve your design via small steps to ensure that your work remains of high quality. TDD promotes confirmatory testing of your application code and detailed specification of that code. Customer tests, also called agile acceptance tests, can be thought of as a form of detailed requirements and developer tests as detailed design. Having tests do “double duty” like this is a perfect example of single sourcing information, a practice which enables developers to travel light and reduce overall documentation. However, detailed specification is only part of the overall picture – high-level specification is also critical to your success, when it’s done effectively. This is why we need to go beyond TDD to consider AMDD. You may even want to “visually program” using a sophisticated modeling tool such as Rational Software Architect (RSA). This approach requires a greater modeling skillset than is typically found in most developers, although when you do have teams made up with people of these skills you find that you can be incredibly productive with the right modeling tools. Active Stakeholder Participation. Stakeholders should provide information in a timely manner, make decisions in a timely manner, and be as actively involved in the development process through the use of inclusive tools and techniques. Architecture Envisioning. At the beginning of an agile project you will need to do some initial, high-level architectural modeling to identify a viable technical strategy for your solution. Document Continuously. Write deliverable documentation throughout the lifecycle in parallel to the creation of the rest of the solution. Document Late. Write deliverable documentation as late as possible, avoiding speculative ideas that are likely to change in favor of stable information. Executable Specifications. Specify requirements in the form of executable “customer tests”, and your design as executable developer tests, instead of non-executable “static” documentation. Iteration Modeling. At the beginning of each iteration you will do a bit of modeling as part of your iteration planning activities. Just Barely Good Enough (JBGE) artifacts. A model or document needs to be sufficient for the situation at hand and no more. Look Ahead Modeling. Sometimes requirements that are nearing the top of your priority stack are fairly complex, motivating you to invest some effort to explore them before they’re popped off the top of the work item stack so as to reduce overall risk. Model Storming. Throughout an iteration you will model storm on a just-in-time (JIT) basis for a few minutes to explore the details behind a requirement or to think through a design issue. Multiple Models. Each type of model has it’s strengths and weaknesses. An effective developer will need a range of models in their intellectual toolkit enabling them to apply the right model in the most appropriate manner for the situation at hand. Prioritized Requirements. Agile teams implement requirements in priority order, as defined by their stakeholders, so as to provide the greatest return on investment (ROI) possible. Requirements Envisioning. At the beginning of an agile project you will need to invest some time to identify the scope of the project and to create the initial prioritized stack of requirements. Single Source Information. Strive to capture information in one place and one place only. Test-Driven Design (TDD). Write a single test, either at the requirements or design level, and then just enough code to fulfill that test. TDD is a JIT approach to detailed requirements specification and a confirmatory approach to testing.